This is the Crain 820 Heavy Duty Undercut Saw. This Jamb Saw is our most powerful and versatile Undercut Saw ever! The large 6 1/2" Carbide-Tipped Blade can fully undercut most doors in place. 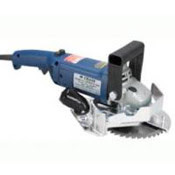 Also included is the No 805 Masonry Blade for undercutting hearths. The Jamb Saw undercuts walls, jambs, corners, and even most toe-spaces. 8.15 amp motor. The Jamb Saw comes with carrying case, spanner wrench, instructions, masonry blade, and one Carbide Tipped blade. This model also has the vac option.